4 Pics 1 Word is the most successful game of the year. The photo based word game has been burning up the iTunes and Google Play charts since January of 2013. And it's now available on desktop: 4 Pics 1 Word Facebook. 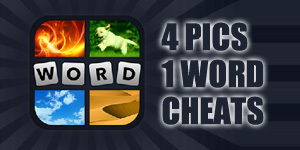 If you need help with the answers for any levels, 4 Pics 1 Word Cheats is the place for you. He have the answers to every level, on every platform. If you need more help or can't find an answer, just post a comment describing the photos in the level. Include the letters and the length of the answer and someone will help you right away. 4 Pics 1 Word Cheats | 4 Pics 1 Word Answers This site is not endorsed by or affiliated with LOTUM GmbH.